For my Infertility readers: please feel free to skip over this post if you are not in a mindset to be reading about others pregnancy. It’s early March and it’s still constantly cold, and I am waiting for spring to come. 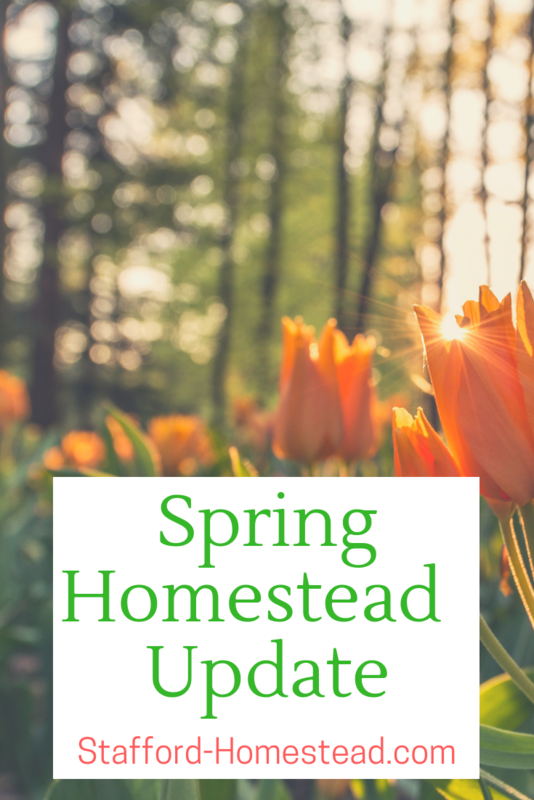 Spring is exciting for me on the homestead because a lot of things start to come to life! On my to do list is starting seeds for my garden. Since I am a member of a CSA my gardens at home I focus on foods my household eats A LOT of. Kale is one of them. I also LOVE BROCCOLI and BRUSSELS SPROUTS. I only grew broccoli one year and was unsuccessful, and the brussels sprouts didn’t even grow at all. This year I am planning on growing Jalepenos, Winter squash, Green beans, Kale… I’m going to try to grow Cauliflower, Brussels Sprouts and Broccoli again… I also planted some garlic heads last fall so we’ll see how that goes! I’ve also been trying to add every year to my Perennial garden ( meaning it grows back every year!) So far I have Asparagus, Strawberries, Raspberry bush and three Blueberry bushes, and some flowers for the bee hives. This year I want to clear an area for perennial herbs! Our bees do not appear to have survived the winter unfortunately. We were doing really good, the end of January I gave them some fondant on a warm day and the cluster was thriving, I even got a sting because I wasn’t wearing my gloves. Fast forward a few weeks, I asked hubby to feed them on the one warm day we were expecting (because I was working) and he forgot, and continued to forget for a few more days. He finally got it done, but unknown to me he did not put the fondant IN THE HIVE. He put it on top of the inner cover.. A few weeks later I went to check on them, and found a dead cluster 😦 It is heart breaking, but normal for first year beekeepers to lose the hive the first winter. The main killers are either starvation, or high mite level. We ordered a new package of bees that will be arriving in about 3 weeks. I’ll be cleaning out the hive on the first warm day we have to make room for the new bees. I bred our rabbits a few days ago. Rabbit gestation is about 31 days so the babies will arrive at the end of march. Nothing cuter than baby bunnies!!! Last two litters I was able to sell all the rabbits for $15 – 20 each. The goal with the rabbits at first was to use them for a meat source for us. After butchering a few rabbits, like 10, hubby decided he doesn’t really like the whole process, and I don’t really mind it, but I didn’t to the actual “dispatching” which mentally is the hardest part. Also cooking rabbit isn’t as easy as chicken… they are much more boney. Even though the meat is good quality and tasty it’s more difficult to prepare and eat. So I think I will focus on selling rabbits instead of butchering them. This year I think I will wait to get more birds until the weather is warmer so I don’t have to use the heat lamp as long and possibly keep them in the coop instead of the basement (it gets really messy!). I haven’t decided chicken or ducks. Right now we have 5 hens and 1 rooster. I’ve also considered buying and incubator to start hatching my own chicks. I’m now in my 16th week of pregnancy, and I feel good. My belly is starting to grow which for me has brought up some interesting feelings. It is incredibly freeing now that I am in the second trimester, and I have more space in my mind to think about new and exciting things. Gone for now are the constant thoughts of “how to get pregnant” and the constant worry of eating the right things, doing the right things and thinking the “right things” so I can become pregnant. Gone for now are the weekly or daily doctor/lab visits. For now I don’t love my belly yet… but it’s “starting to grow on me” (pun intended). I mostly just feel like I’m gaining weight from over eating or lack of exercise, so it has motivated me to keep up my healthy life style, but getting back on track after the first trimester is not exactly easy. I have less energy than pre-pregnancy me, and I have more difficulty doing exercises I have done for years… Its important for me to remember that I do have to slow down and take it a little easier, but mentally it makes me feel like I’m not trying hard enough. The baby name front has been much more difficult than I expected. Now that I’m actually pregnant, all of the names I previously liked, don’t seem good enough. I can’t imagine myself calling them anything for the rest of my life. It’s a big decision. I very much want to stay away from the top 100 names, but I also don’t want their name to be so unique that people find it strange or silly. Previous Transitioning From “Infertile” to Pregnant.